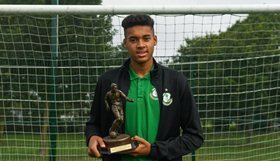 League of Ireland Premier Division club Shamrock Rovers have confirmed via their official website that Nigeria-eligible goalkeeper Gavin Bazunu has completed his transfer to Manchester City. The Citizens indicated as much at the close of the January transfer window as the goalkeeper has been registered for the second half of the Premier League as an U21 player. Shamrock Rovers Sporting Director Stephen McPhail has explained why Bazunu's transfer to Man City was brought forward as he was initially set to join the Premier League champions in the summer. He said : ''Gavin has completed the move earlier than we originally expected and we wish Gavin all the very best in his career development at City. ''Whilst we originally planned for Gavin to stay at Rovers until July and see out his education to complete his Leaving Certificate at our education partner Ashfield College, arrangements have been made to accommodate Gavin doing his studies and moving to Manchester. Allnigeriasoccer.com understands that the 2002-born Bazunu is on the radar of the Nigeria Football Federation, with a view to a call-up to the Golden Eaglets.